Test yourself with these 62 questions from the DVSA revision question bank on handling your vehicle under more difficult conditions and circumstances. Be patient and stay behind the car in front. Normally you should not overtake other vehicles in traffic-calmed areas. If you overtake here your speed may exceed that which is safe along that road, defeating the purpose of the traffic calming measures. You should brake and slow down before selecting a lower gear. The gear can then be used to keep the speed low and help you control the vehicle. This is particularly helpful on long downhill stretches, where brake fade can occur if the brakes overheat. Bright rear fog lights might be mistaken for brake lights and could be misleading for the traffic behind. You may pass slower traffic on their left while driving along a one-way street. Be aware of drivers who may need to change lanes and not expect faster traffic passing on their left. Driving in neutral or with the clutch down for long periods is known as ‘coasting’. There will be no engine braking and your vehicle will pick up speed on downhill slopes. Coasting can be very dangerous because it reduces steering and braking control. It is an offence to have your fog lights on in conditions other than seriously reduced visibility, ie. less than 100 metres (328 feet). Only use front fog lights if the distance you are able to see is less than 100 metres (328 feet). Turn off your fog lights as the visibility improves. You must take extra care when on single track roads. You may not be able to see around bends due to high hedges or fences. Proceed with caution and expect to meet oncoming vehicles around the next bend. If you do, pull into or opposite a passing place. aSnow chains can be fitted to your tyres during snowy conditions. They can help you to move off from rest or to keep moving in deep snow. You will still need to adjust your driving according to the road conditions at the time. Try to look ahead and read the road. Plan your approach to junctions and select the correct gear in good time. This will give you the control you need to deal with any hazards that occur. You’ll coast a little every time you change gear. This can’t be avoided, but it should be kept to a minimum. You won’t be able to see as far ahead in fog as you can on a clear day. You will need to reduce your speed so that, if a hazard looms out of the fog, you have the time and space to take avoiding action. Travelling in fog is hazardous. If you can, try and delay your journey until it has cleared. In normal conditions a Ford can be crossed quite safely by driving through it slowly. The water may affect your brakes, so when you're clear of the Ford test them before you resume normal driving. Switch off your fog lights if the weather improves, but be prepared to use them again if visibility reduces to less than 100 metres (328 feet). Always use your headlights at night on a motorway unless you have stopped on the hard shoulder. If you break down and have to stop on the hard shoulder, switch off the headlights but leave the sidelights on so that other road users can see your vehicle. When visibility is seriously reduced, switch on your fog lights if you have them fitted. It is essential not only that you can see ahead, but also that other road users are able to see you. Fog lights will help others see you, but remember, they must only be used if visibility is seriously reduced to less than 100 metres (328 feet). You MUST use dipped headlights and/or fog lights in fog when visibility is seriously reduced to 100 metres (328 feet) or less. You should use dipped headlights, but NOT fog lights, when visibility is poor, such as in heavy rain. If you’re driving on a motorway at night or in poor visibility, you must always use your headlights, even if the road is well-lit. The other road users in front must be able to see you in their mirrors. It is an offence to use fog lights if the visibility is better than 100 metres (328 feet). Switch front fog lights off if the fog clears to avoid dazzling other road users, but be aware that the fog may be patchy. Only use your fog lights when visibility is seriously reduced. Use dipped headlights in poor conditions. Consider if the increased risk is worth it. If the weather conditions are bad and your journey isn’t essential, then stay at home. Holding the clutch down or staying in neutral for too long will cause your vehicle to freewheel. This is known as ‘coasting’ and it is dangerous as it reduces your control of the vehicle. • green between the carriageway and slip roads. If you have to park your vehicle in foggy conditions it’s important that it can be seen by other road users. Try to find a place to park off the road. If this isn’t possible leave it facing in the same direction as the traffic. Make sure that your lights are clean and that you leave your sidelights on. You MUST turn off your fog lights if visibility is over 100 metres (328 feet). However, be prepared for the fact that the fog may be patchy. Your vehicle should have a warning light on the dashboard which illuminates when the fog lights are being used. You need to be familiar with the layout of your dashboard so you are aware if they have been switched on in error, or you have forgotten to switch them off. If you’re planning to make a journey when it’s foggy, listen to the weather reports on the radio or television. Don’t travel if visibility is very poor or your trip isn’t necessary. If you do travel, leave plenty of time for your journey. If someone is expecting you at the other end, let them know that you’ll be taking longer than normal to arrive. You will have additional hazards to deal with at night. Visibility may be very limited and the lights of oncoming vehicles can often dazzle you. When this happens don’t close your eyes, swerve or flash your headlights, as this will also distract other drivers. 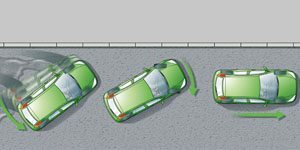 It may help to focus on the left kerb, verge or lane line. If visibility falls below 100 metres (328 feet) in fog, switching on your rear fog lights will help following road users to see you. Don’t forget to turn them off once visibility improves: their brightness might be mistaken for brake lights and they could dazzle other drivers. It is illegal to use fog lights unless visibility is seriously reduced, which is generally when you cannot see for more than 100 metres (328 feet). Check that they have been switched off when conditions improve. A warning light will show on the dashboard to indicate when your rear fog lights are on. You should know the meaning of all the lights on your dashboard and check them before you move off and as you drive. To prevent your lights from dazzling the driver of the car in front, wait until you’ve overtaken before switching to full beam. Traffic calming measures are used to make the roads safer for vulnerable road users, such as cyclists, pedestrians and children. These can be designed as chicanes, road humps or other obstacles that encourage drivers and riders to slow down. If your rear fog lights are left on when it isn’t foggy, the glare they cause makes it difficult for road users behind to know whether you are braking or you have just forgotten to turn off your rear fog lights. This can be a particular problem on wet roads and on motorways. If you leave your rear fog lights on at night, road users behind you are likely to be dazzled and this could put them at risk. Don’t travel in icy or snowy weather unless your journey is necessary. Drive extremely carefully when roads are or may be icy. Stopping distances can be ten times greater than on dry roads. These lines may be painted on the road on the approach to a roundabout, village or a particular hazard. The lines are raised and painted yellow and their purpose is to make you aware of your speed. Reduce your speed in good time so that you avoid having to brake harshly over the last few metres before reaching the junction. Don’t forget to switch off your fog lights when the weather improves. You could be prosecuted for driving with them on in good visibility. The high intensity of rear fog lights can dazzle following drivers and make your brake lights difficult to notice. A ford is a crossing over a stream that’s shallow enough to go through. After you’ve gone through a ford or deep puddle the water will affect your brakes. To dry them out apply a light brake pressure while moving slowly. Don’t travel at normal speeds until you are sure your brakes are working properly again. Coasting is when you allow the vehicle to freewheel in neutral or with the clutch pedal depressed. Speed will increase as you lose the benefits of engine braking and have less control. You shouldn't coast when approaching hazards such as junctions or bends and when travelling downhill. The engine will need more power to pull the vehicle up the hill. When approaching a steep hill you should select a lower gear to help maintain your speed. You should do this without hesitation, so that you don’t lose too much speed before engaging the lower gear. Ensure that your vehicle can be seen by other traffic. If possible, park your car off the road in a car park or driveway to avoid the extra risk to other road users. If you have to drive in fog, drive with you dipped beam headlamps on and keep your windcsreen clear. You should always be able to pull up within the distance you can see ahead. The purpose of a box junction is to keep the junction clear by preventing vehicles from stopping in the path of crossing traffic. You must not enter a box junction unless your exit is clear. But, you may enter the box and wait if you want to turn right and are only prevented from doing so by oncoming traffic. It is essential that the traffic behind is given a clear warning when you brake. In good visibility, your rear fog lights can make it hard for others to see your brake lights. Make sure you switch off your fog lights when the visibility improves. Prevention is better than cure, so it’s important that you take every precaution to avoid a skid from starting. If you feel the rear wheels of your vehicle beginning to skid, try to steer in the same direction to recover control. Don’t brake suddenly – this will only make the situation worse. Fog lights can be brighter than normal dipped headlights. If the weather has improved turn them off to avoid dazzling other road users. A rumble device consists of raised markings or strips across the road. It gives drivers an audible, visual and tactile warning. They are found along the hard shoulder on the motorway and approaching some hazards to alert drivers of the need to slow down. This is more likely to happen on vehicles fitted with drum brakes but can apply to disc brakes as well. Using a lower gear will assist the braking and help you to keep control of your vehicle. If you’re following another road user in fog stay well back. The driver in front won’t be able to see hazards until they’re close and might brake suddenly. Another reason why it is important to maintain a good separation distance in fog is that the road surface is likely to be wet and slippery. Don’t overtake if there’s a possibility of a road junction, bend or brow of a bridge or hill ahead. There are many other possible hazards that may be difficult to see in the dark so only overtake if you’re certain that the road ahead is clear. Don’t take a chance. When going downhill, prolonged use of the brakes can cause them to overheat and lose their effectiveness. Changing to a lower gear will assist your braking. Watch out for people close to the kerb or crossing the road. Trams can run on roads used by other vehicles and pedestrians. The part of the road used by the trams is known as the reserved area and this should be kept clear. It often has a different surface and is usually edged with white road markings. Rear fog lights make it easier to spot a vehicle ahead in foggy conditions. Avoid the temptation to use other vehicles’ lights as a guide, as they may give you a false sense of security. Rear fog lights shine brighter than normal rear lights so that they show up in reduced visibility. When the weather is clear they could dazzle the driver behind, so switch them off. If the skid has been caused by braking too hard for the conditions, release the brake. You may then need to reapply and release the brake again. You may need to do this a number of times. This will allow the wheels to turn and so limit the skid. Skids are much easier to get into than they are to get out of. Prevention is better than cure. Stay alert to the road and weather conditions. Drive so that you can stop within the distance you can see to be clear. If you’re driving behind other traffic at night on the motorway, leave a two-second time gap and use dipped headlights. Full beam will dazzle the other drivers. Your headlights’ beam should fall short of the vehicle in front. The draught caused by other vehicles could be strong enough to push you out of your lane. Keep both hands on the steering wheel to maintain full control. Having tyres correctly inflated and in good condition will ensure they have maximum grip on the road; how well your tyres grip the road has a significant effect on your car's stopping distance. Other drivers or riders may have to change course due to the size or characteristics of their vehicle. Understanding this will help you to anticipate their actions. Motorcyclists and cyclists will be checking the road ahead for uneven or slippery surfaces, especially in wet weather. They may need to move across their lane to avoid surface hazards such as potholes and drain covers. As well as visibility being reduced, the road will be extremely wet. This will reduce the grip the tyres have on the road and increase the distance it takes to stop. Double your separation distance.